Since 1987, members of the United Nations have strived for improving sustainability to fulfill the vision of sustainable development. Current discussions focus on the role of collaborations between public and private actors to realize social, ecological, and economic sustainability. This study explores how public–private partnerships may contribute to the achievement of sustainability-related outcomes by analyzing a longitudinal case in the German public bathing and swimming pool sector. The empirical findings illustrate how both external conditions, such as regulation or industry-self regulation, and internal elements, such as specific structure and process elements of the public–private partnership, contribute to sustainability-related outcomes. Results reveal an interaction of specific external conditions and some internal elements. Our findings serve as a starting point for further empirical investigations of the sustainable provision of public services via public–private partnerships, and form a basis for theory development. The revealed insights result in practical implications for partners involved in public–private partnerships. Since 1987, members of the United Nations (UN) have been striving to improve sustainability in their countries to fulfill the vision of sustainable development (World Commission on Environment and Development (WCED) 1987, also known as the Brundtland report). The central norm of the UN’s vision is to “make development sustainable to ensure that it meets the needs of the present without compromising the ability of future generations to meet their own needs” (WCED 1987, p. 17). This norm of intergenerational justice has been supplemented by the integrated view of three pillars of sustainability—economic, ecological, and social sustainability—during the Rio Conference 1992 (Jordan 2008). As a consequence, the notions of sustainable development and sustainability are drawing together ideas concerning human welfare, protecting the biosphere, balancing generational interests, and public participation in decision-making (Fiorino 2010; Hopwood et al. 2005; Meadowcroft et al. 2005). For public authorities, the sustainable development agenda challenges the nature and effectiveness of governing and governance to “put society on a more sustainable track” (Jordan 2008, p. 17). At the World Summit on Sustainable Development in Johannesburg in 2002 (United Nations 2002), public–private partnerships were promoted as a promising instrument for the sustainable provisioning of public services (Dellas 2011; Pattberg et al. 2012). This perspective has been strengthened with the Agenda 2030 and the 17 sustainable development goals (SDG; see United Nations 2015): Public sector actors work together with private sector actors to accomplish sustainability-related objectives (Pinz et al. 2018). However, the focus on short-term cost reductions in many public–private partnerships might be at odds with long-term sustainability outcomes (van Gestel et al. 2008; Koppenjan and Enserink 2009). 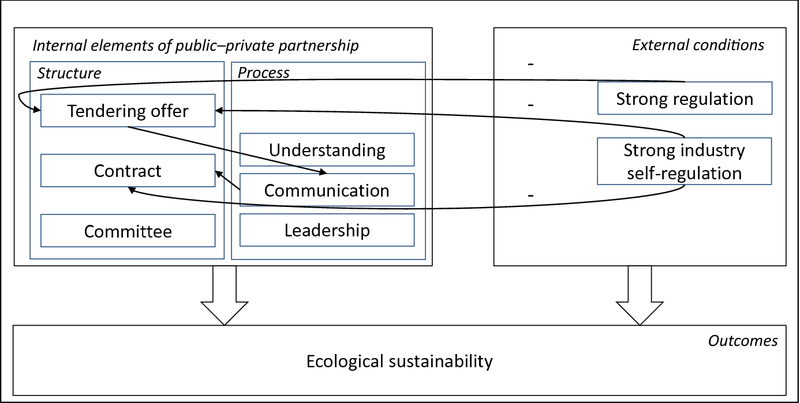 As the current literature addresses sustainability issues in combination with public–private partnerships rather implicitly than explicitly (e.g., Kwak et al. 2009; Pinz et al. 2018), there is little knowledge on the contribution of public–private partnerships to sustainability. Against this background, we aim to investigate how precisely public–private partnerships contribute to sustainability, assessed according to its three dimensions (economic, ecological, and social sustainability). To do so, we analyze external conditions (regulation and industry self-regulation) which may be relevant to the contribution of a public–private partnership to sustainability, as well as elements that are internal to a public–private partnership (structure and process elements). We develop a conceptual framework which integrates the external conditions and internal elements that may relate to the achievement of sustainability-related outcomes in public–private partnerships, and apply this framework to a single case study of a public–private partnership in the German public bathing and swimming pool sector. This sector was purposefully chosen as it is suited to investigate the achievement of sustainability-related outcomes due to high regulation and industry self-regulation targeting sustainability and, additionally, due to a close relationship to the sustainable development goals. Findings regarding external conditions of public–private partnerships show that for economic sustainability, regulation is important, whereas for ecological sustainability, regulation and industry self-regulation seem to complement each other. For social sustainability, citizen initiatives come into play as relevant external conditions. The findings regarding internal elements vary slightly for the three sustainability dimensions. Elements that are important for all three dimensions are contracts and committees as structural variables; and shared understanding, communication, and leadership as process variables. These results are discussed against the background of prior research and managerial implications are drawn. The conclusion briefly summarizes the main contributions and outlines avenues for further research. Traditionally, the public sector has primarily governed towards sustainability by regulation. The regulation of ecological and social issues is often imposed by global initiatives, leading to country-specific hard (legislation) and soft (directives, guidelines) efforts to change corporate behaviour (Albareda et al. 2007; Christmann 2004; Gonzáles and Martinez 2004; Eberlein and Matten 2009; Peltzman et al. 1989). For example, because the European Commission emphasized the different sectors’ responsibilities for social and environmental matters (European Commission 2010; see also Delbard 2008), the German government published a National Strategy for Corporate Social Responsibility in 2010 (Federal Ministry of Labor and Social Affairs 2010). This strategy integrates the three pillars of ecological, economic, and social sustainability in the construction industry, which is of relevance to the empirical part of our study (Federal Ministry of Transportation, Building and Urban Development 2009). In addition to or in replacement of regulation, private actors are often found to establish industry self-regulation. Industry self-regulation is used as an umbrella term for initiatives, often led by industry associations, to establish rules and standards to regulate corporate behaviour and competition, while industry members decide independently about their participation and extent of commitment (Barnett and King 2008; Bowen et al. 2018; Grabosky 2013; Hart 2010; Hoffman and Georg 2013). Industry self-regulation can generally be proactive or reactive and is expected to complement regulation (Gupta and Lad 1983). However, empirical research has shown that industry self-regulation often falls short of desired economic and environmental outcomes and thereby does not convincingly fill regulatory voids (Bowen et al. 2018; Hoffman and Georg 2013; King and Lenox 2000; King et al. 2012). Against the background of remaining open questions regarding the contribution of both regulation and industry self-regulation to increased sustainability, we consider both as potentially relevant (substituting or complementing) external conditions for public–private partnerships with sustainability-related objectives. ‘External’ refers to the fact that any public–private partnership in a specific industry takes place within a certain frame of regulation and industry self-regulation. Regulation and industry self-regulation might have a direct influence on sustainability-related outcomes of the public–private partnership. For instance, in a sector where reduced energy consumption is part of the industry self-regulation, the reduced energy consumption may be an outcome of a public–private partnership in this sector as well. The next paragraph will focus on these partnerships and their relation with sustainability. Regarding the achievement of sustainability, the World Summit on Sustainable Development in Johannesburg in 2002 explicitly called for the implementation of public–private partnerships (United Nations 2002). These partnerships can be defined as “a cooperative arrangement between the public and private sectors that involves the sharing of resources, risks, responsibilities, and rewards with others for the achievement of joint objectives” (Kwak et al. p. 52). Public–private partnerships range from informal to contractual arrangements or mixed public–private company foundations (Albalate et al. 2014; Steijn et al. 2011). Round table discussions between public and private sector partners reflect informal arrangements. Contracting for a specific project leads to a contractual public–private partnership. Companies with both public and private ownership can also be called institutional public–private partnerships (for various classification attempts, see for example Grimsey and Lewis 2004; Koppenjan and Enserink 2009; Kwak et al. 2009; Petersen 2011). Independent of the specific arrangement, the lack of public funds and inefficiency of public services are seen as drivers for public–private partnerships (Forrer et al. 2010; Koppenjan and Enserink 2009; Ysa 2007). The underlying assumption is that the public sector lacks knowledge of the most cost-effective way to deliver a public good or service and gains technical expertise from the private partner, in exchange for a long-term service contract (Forrer et al. 2010). Through the efficient and effective combination of complementary knowledge and capabilities, both sides can benefit from such partnerships (Hodge and Greve 2007; van Gestel et al. 2008). However, as many unsuccessful public–private partnerships in various countries exemplify (Kwak et al. 2009; see also Chen et al. 2013), these positive outcomes can only be achieved if the partners find “the right balance between the investors’ willingness to invest … and long-term sustainability objectives” (Koppenjan and Enserink 2009, p. 293). Overall, the breadth of public infrastructure makes it difficult to draw a coherent picture on the general appropriateness of public–private partnerships (Roehrich et al. 2014). Many researchers agree, however, that making partnerships work (Warsen et al. 2018) depends on various structural and process elements (Bryson et al. 2006, 2015; Ysa 2007). These elements are internal to public–private partnerships (as opposed to external conditions that are industry specific) and we label them as ‘internal elements’ in the following. Structural elements comprise the contract between the public and the private partner, which most generally aims at reducing information asymmetries in principal–agent relationships (Jensen and Meckling 1976). Regarding sustainability, a contract may serve to fix economic, ecological, and social aspects in a legally binding manner. Existing literature on sustainability and public–private partnerships reveals that sustainability-related objectives might also be part of the tendering offer (Hueskes et al. 2017). Koppenjan and Enserink (2009) suggest appropriate incentives for sustainability as a standard of good practice within public–private partnerships. Empirical studies explicitly addressing sustainability refer to governance (Walker and Hills 2012), managerial accounting (Fobil et al. 2008) and evaluation (Patil et al. 2016) as relevant structural elements to achieve sustainability-related objectives (Pinz et al. 2018). With respect to process elements, the literature on public–private partnerships, and on collaborations in general, points to the relevance of process elements that go beyond legal contract specifications (Bovaird 2004; Emerson et al. 2012; Rufin and Rivera-Santos 2012; Teicher et al. 2006). It has been shown that trust and shared understanding are crucial elements (Bovaird 2004; Teicher et al. 2006). Under the notion of collaborative dynamics, the importance of principled engagement has been discussed theoretically, in particular, fair and open discussion as well as communication, shared motivation (mutual trust and understanding, internal legitimacy, shared commitment), and capacity for joint action (procedural arrangements, leadership, knowledge, resources) (Emerson et al. 2012). Transferring these aspects to sustainability in public–private partnerships, discussions on sustainability-related objectives, trust in the partners’ interest in sustainability, and a mutual understanding of sustainability might thus be of relevance. With respect to leadership for sustainability as a process element, both partners may show leadership: On the public side, governments “are bound to the norms and rules they wish to impose on others,” but are also “expected to show exemplary behaviour”—particularly in public–private partnerships (Klijn and Koppenjan 2000, p. 152). On the private side, companies are expected to show leadership for sustainability, e.g. by committing to implementing policies targeting social sustainability (European Commission 2011; van Marrewijk 2003). In this understanding, private corporations should not only seek to maximize their profits, but should also be aware of their social and ecological responsibilities (Crane and Matten 2007; Matten et al. 2003; Palazzo and Scherer 2006). Again transferring these aspects to sustainability in public–private partnerships, both public and private partners potentially fulfil a leadership role. Pinz et al. 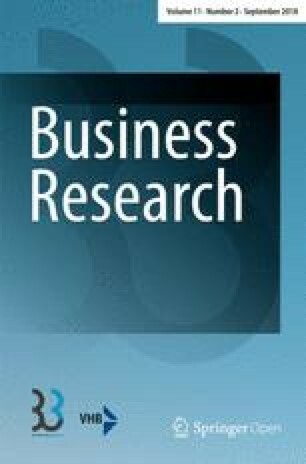 (2018) show that the first empirical studies on sustainability and public–private partnerships reveal strategy, planning, risk management, and negotiation (Fobil et al. 2008; Kort and Klijn 2011; Lenferink et al. 2013; Liu et al. 2010) as relevant process elements. In addition, these studies refer to collaborative elements as relevant to the achievement of sustainability-related objectives (Lenferink et al. 2013; Liu et al. 2010, Walker and Hills 2012). 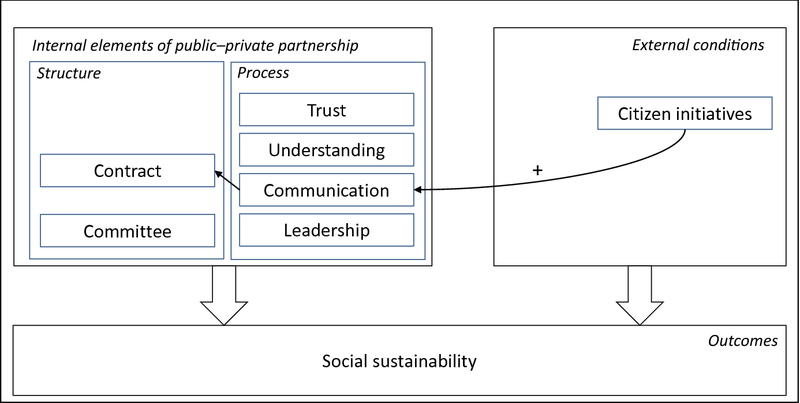 To sum up, a public–private partnership’s internal elements, distinguished as structure and process elements, may both have an impact on sustainability-related outcomes. Furthermore, the external conditions discussed in Sect. 2.1 may influence the internal elements. For example, regulation in the construction industry may impose several working standards to be part of contracts and tendering offers within a public–private partnership. Figure 1 displays the internal and external elements, as well as the described relations determining sustainability-related outcomes of public–private partnerships. To investigate our exploratory research question on how public–private partnerships may achieve sustainability-related outcomes, we have selected a critical case based on a purposeful sector selection to conduct a single case study (Flyvbjerg 2006; Ridder 2017; Yin 2013). Against the background of our conceptual framework spanning external conditions and internal elements, we aimed to analyze a case in a sector which would allow us to explore both regulation and industry self-regulation, potentially enhancing sustainability-related outcomes. Thus, the sector should also be suited to investigate a broad range of sustainability-related issues. In line with the presented definition of public–private partnerships, the public–private partnership itself should be characterized by a high degree of freedom for both partners. Such a degree of freedom enables the partners to show leadership regarding sustainability outcomes over time. Within the broad range of potential public services, we consequently decided to focus on voluntary public services where we would expect more innovative forms of public–private partnerships to be installed. In Germany, the classification of public services into delegated functions and matters of municipal self-government (including voluntary public services) is defined in article 28 and article 83 of the German constitution (Bundesrepublik Deutschland 2017). For voluntary public services such as sport, leisure, and culture, the municipal council has the decision-making power regarding if and how a task is fulfilled (Bogumil and Holtkamp 2013). Thus, the public partner has a higher degree of freedom about how to draft the offered services, and therefore, also the partnership compared to other public services. Within voluntary public services, we decided to focus on the public bathing and swimming pool sector (in German Baederwesen). In Germany, municipal swimming pools as voluntary public service have existed since 1855; today, an enormous need for restoration can be observed in more than 7500 public indoor and outdoor swimming pools (estimations ranging from 6 to 8 billion EUR, Partnerschaft Deutschland 2011). As a result, to preserve public swimming pools as a form of voluntary public infrastructure and complete necessary renovations despite their budget restraints, several German municipalities have turned to public–private partnerships (Partnerschaft Deutschland 2017; Hannemann 2009; Partnerschaft Deutschland 2011). From today’s point of view, we can show a close relationship of this sector to the following SDGs. From the public perspective, the bathing and swimming pool sector is part of the area of SDG 9 (Build resilient infrastructure, promote inclusive and sustainable industrialization, and foster innovation), since municipal investment in a publicly accessible swimming pool is contributing to the available infrastructure. The fact that citizens and sports clubs can participate in sports may contribute to various SDGs, especially SDG 3 (Ensure healthy lives and promote well-being for all at all ages; Lindsey and Chapman 2017). From the citizens’ perspective, a municipal swimming pool allows them to make individual decisions regarding sustainable consumption (SDG 12), since most swimming pools offer various services (Erdély 2009). Furthermore, integrating the infrastructure in a balanced way for citizens living in both urban and rural environments may contribute to SDG 11 (Make cities and human settlements inclusive, safe, resilient and sustainable; target 11.A). If not only citizens are potential visitors of the swimming pool, the sector also offers a link to sustainable tourism (SDG targets 8.9 and 12.B). In an aging society such as Germany, the sports and leisure sector including swimming pools is likely to also contribute to SDG 8 (Promote sustained, inclusive and sustainable economic growth, full and productive employment and decent work for all; see Heinze and Naegele 2009). Regarding economic sustainability, the public–private partnership reduces public expenditures while offering a new tourist attraction that creates new jobs and raises tax income with its life cycle approach—against the background of restricted public funds and the need for restoration. This regional value creation and the financial feasibility due to guarantees (in terms of forfaiting) are most relevant to this sustainability dimension. Ecological sustainability in this public–private partnership includes aspects of energy and water consumption; and quality, landscape, and regional traffic. The project plan included a glass construction to heat the bathing and swimming pool complex with solar energy, which can be opened in the summer to cool the complex down. The increase in traffic volume was to be compensated by shuttle busses and the location near the highway. Regarding social sustainability, the public–private partnership under investigation engaged several stakeholders: citizens (not automatically being customers of public infrastructure), customers, employees, and local small and medium-sized enterprises. The partners discussed the project with schools and sports clubs. The municipality conducted a citizen assembly as well as round table discussions. With respect to customers, the admission fees for the public part of the swimming pool complex amounted to a socially acceptable and affordable fee. The private partner subsidized the public open-air swimming pool with an annual amount from the profits generated in the new swimming pool complex. Public sector employees were benefited by job enrichment and enduring job security. To support participation of local enterprises, especially small and medium-sized ones, the project was divided into subparts. Beyond its fulfillment of certain aspects of the three sustainability dimensions, the identified critical case can be described in the following way: The public partner, a municipality with 35,500 inhabitants, is located in between several larger cities and has access to important highways. In 2006, the municipality had four public swimming pools: two located in public schools, one open-air, and one indoor. Noting the need to renovate these pools, the municipal council asked the administration to suggest alternatives on how to renovate and maintain the municipal swimming pools. In a first step, the municipality decided to build a new public indoor swimming pool through traditional procurement. Due to the fact that private companies indicated interest in investing and due to the municipality’s positive experiences with public–private partnerships, the municipality considered the option of a collaborative approach. It invited companies throughout Europe to tender offers for building the new indoor swimming pool that could meet the needs of sports clubs, schools, and the general public. Out of three propositions received, the municipality chose one to negotiate with and awarded it the contract to plan, build, and operate the swimming pool. The private partner is a Germany-based, globally operating company, which is renowned as an engineer, builder, and operator of large swimming pools. The new pool was to be located in a recently established industrial area close to the highway. The public–private partnership design of our case is marked by the idea of including the whole life-cycle of the swimming pool into the partnership and thus represents the current generation of public–private partnerships (i.e. contract over 25 years). The public–private partnership is labelled a plan, build, operate model with particular characteristics: instead of establishing a public–private joint venture, the private partner founded a new private limited company. Within the newly built complex, the public swimming pool is operated by public employees under the same roof as the private swimming pool and sauna areas. However, the design is considered modular since, on the one hand, the public partner could operate the public part independently in the case of the private partner’s bankruptcy; on the other hand, the private partner can enlarge the private part of the complex. We were able to investigate the case at two points in time, in the planning (pre-contract, 2011) and in the operating phase (2013/2014). To collect the data, we conducted semi-structured expert interviews with 11 key informants (duration on average: 51 min in the pre-contract phase (t = 1, February through June 2011; 4 interviewees) and the operating phase (t = 2, July 2013 through January 2014; 9 interviewees). The key informants included all actors holding a central position in the public–private partnership, i.e. members of the municipal council, mayors, heads of municipal main office and municipal services, and private partner executives. The semi-structured interviews allowed for an extensive collection of information that is not predetermined or biased (Yin 2013). 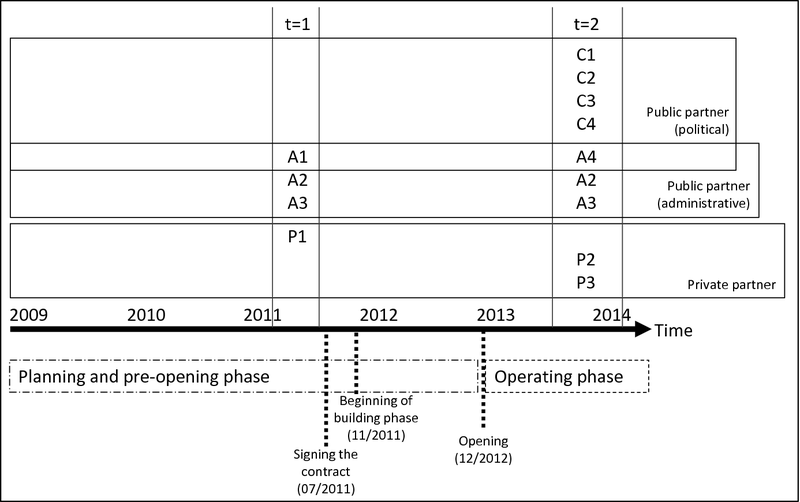 Figure 2 illustrates the data collection process alongside the project’s progression and includes the abbreviations for the interviewees (A for interviewees from public administration, P for interviewees from the private company, C for members of the municipal council). The interviewees in this case study are P1 (founder and CEO of the private partner-company; interviewed at t = 1), P2 (facility manager) and P3 (responsible project manager of the private-partner company, both interviewed at t = 2) as private-partner experts. As public-partner experts, interviewees are A1 and A4 (two consecutive mayors of the municipality involved, A1 interviewed at t = 1 and A4 interviewed at t = 2, who are both head of the political sphere in the municipality and head of the municipal administration); A2 (head of the municipal main office, responsible for the administration of tenders and negotiation for the project, interviewed at t = 1 and t = 2); and A3 (head of the municipal services, responsible for the technical issues of the project, interviewed at t = 1 and t = 2). In addition, four members of the municipal council with different political party affiliations were interviewed (C1, C2, C3, C4, t = 2). These four interviewees were also part of the “economic and information committee” that has been installed in the pre-opening phase consisting of the key actors on both the private and the public partners’ sides as well as selected members of the municipal council. Thus, this committee serves as an intermediary between those directly involved in the project and the municipal council. This committee is not included in the organizational chart but its existence (also in the operating phase) and role are fixed in the contract. The interview structure was based on the presented conceptual framework, thereby addressing understanding and dimensions of sustainability, external conditions (regulation and industry self-regulation), internal elements (process and structure), and their interplay contributing to sustainability-related outcomes. All interviews were recorded, transcribed, and coded with MaxQDA software (VERBI Software GmbH 1989–2015). An additional documentary analysis, featuring newspaper articles, homepages (such as the German public–private partnership projects database), and project-based documents obtained from the interviewees, allowed us to triangulate our findings. This assured construct validity (Yin 2013). To obtain investigator triangulation, we conducted the interviews jointly where possible and discussed in detail the coding of the interviews and the document analyses (Lewis et al. 2014; Yin 2013). The data analysis relies on an inductive–deductive coding process (Miles et al. 2014). A first coding step relied on the interview guidelines and the conceptual framework. This provided deductive codes, such as the understanding and dimensions of sustainability, external conditions, and process and structural elements contributing to sustainability-related objectives. In a second step, a more fine-grained inductive coding took place. Table 1 gives an overview of the coding scheme, and includes paraphrased anchor examples of key findings. The findings section follows the elements introduced in our conceptual framework. For each dimension of sustainability-related outcomes, we separately analyze external conditions, structural and process elements, and elaborate on the potential interplay of external conditions and internal elements. Within the sub-chapters of the findings section, we will first show all external conditions and internal elements that were interpreted as relevant to achieve the respective sustainability dimension graphically and in written form. Then, we will elaborate on the interplay between the elements which can be observed in three different ways. First, an external condition might make it necessary that a specific internal element focuses on sustainability-related outcomes (displayed by an arrow marked with ‘+’). Second, an external condition might cause that a specific internal element does not have to focus on certain sustainability-related outcomes (displayed by an arrow marked with ‘−‘).Third, the orientation towards sustainability-related outcomes of a specific internal element (i.e., structural or process variables) might relate to the orientation towards sustainability-related outcomes of another internal element (marked with neutral arrows). 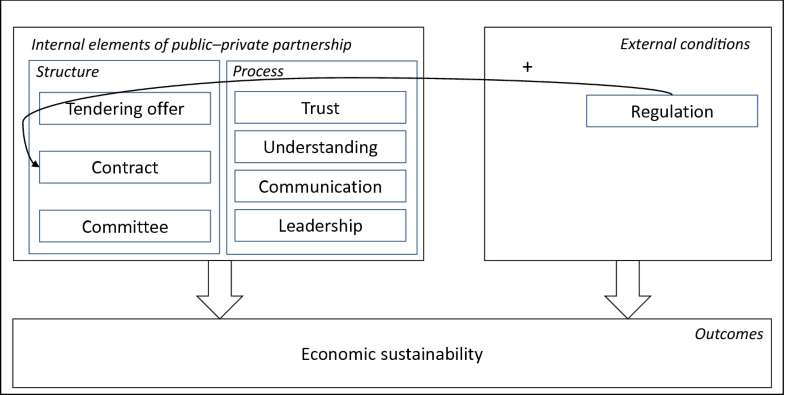 Figure 3 illustrates both external conditions and internal elements that have been shown to have an impact of the public–private partnerships’ contribution to economic sustainability. It also indicates an interplay between these elements. Regarding external conditions and their impact on the economic dimension of sustainability-related outcomes of the public–private partnership, regulation is of relevance, as can be shown by the supervisory authority (Regierungspraesidium) which oversees the municipality’s public expenditure. With respect to structural elements, the tendering offer, contract, and economic and information committee play a crucial role: A functional tendering offer that did not specify all technical details was chosen by the municipality (A3_1). Among the tenderers, the private partner won the tendering primarily for economic reasons (A1). This is in line with European and federal-state procurement regulations, which traditionally focus on economic criteria only. As a result, including further sustainability-related aspects in the tender offer was difficult (A3_2; P3). Regarding the contract as a structural element, our data reveals that the contract between the private partner and the municipal services enterprise as well as using agreement (P2) are the crucial instruments for the functioning of the partnership. This is due to its long-term perspective of 25 years and its legally binding character (C1; A2_2; P2; A3_1; P3). “An extensive amount of documents is needed at the conclusion of the contract; however, it is never exhaustive” (A3_2). According to the contract, the private partner obtains a yearly amount of money over the life-cycle for building the swimming pool. At the same time, the private partner pays money back to the community as soon as a specific number of guests per year is achieved. The contract also contains the obligation to reveal financial data (P3). The contract also placed the partners under the obligation to install an information and economic committee with information and control, i.e. accountability mechanisms, as main tasks (C1, C2, C3, A2_2, P2, P3, A3_2). The members of the committee get information and may ask further questions or make suggestions (C2; C4; A3_2)—including suggestions on social, ecological and economic aspects. The municipal partner utilizes this committee as a multiplier into the municipal council (A2_2). However, in the operating phase, the role of the committee is perceived as decreasing (C1). “Talking about our swimming pool again, I would like to point out that we desired a long-term solution which is economically interesting and ecologically justifiable, with a social background. Sustainability unites all three aspects. You can’t unhinge one of these” (A1). From the private perspective, the long-term outlook was prevalent, linked to the idea to always “think one step further” (P3): “The amount of invested money we bring into the region in the long run—this means sustainability to me. To create something that many people can benefit from; perhaps even future generations” (P1). The private partner is committed to share its profit with the broader public (A2_1, P1). In addition, communication with different stakeholders contributes to sustainability as it enables the consideration of the stakeholders’ needs: Communication between the private partner and the municipal services contributed to agreements on sustainability-related outcomes beyond the requirements (P2). Our data further reveals leadership by either the public or the private partner as relevant to the achievement of sustainability-related outcomes. The public partner puts emphasis on the private partner’s innovative capacity and expert knowledge in general (C1; P1). This is supported by the public perspective: “We are no swimming pool providers” (A3_1). However, the public partner shows leadership for economic sustainability in terms of public resources. With regards to economic sustainability, the empirical data reveals only one interrelation: To guarantee its accordance with existing regulation and to prevent fraud or waste of public financial resources (C1; A3_2), the contract and financing had to be reviewed by the municipality’s supervisory authority. In Fig. 3, the arrow relating regulation and contract marked with “+” illustrates this interrelation. As depicted in Fig. 4, with reference to external conditions, the general regulatory setting can be described as extensive, since it is determined by national and federal guidelines on aspects related to ecology, such as water quality and fire protection, etc. Furthermore, the local health authority had to approve the water treatment (regulated by the German norm DIN 19463) before the swimming pool complex could be opened (A3_2). As a matter of industry self-regulation since the late nineteenth century, the swimming pool industry across Germany has been organized in a non-profit industry association (since 2010: Deutsche Gesellschaft für das Badewesen e.V.). This association collaborates closely with regulatory institutions, such as the German standardization organization (DIN), and issues guidelines regarding the use of chemicals, saving natural resources, lighting, service regulations, etc., to set industry standards. This was reflected by the fact that all competitors applying for the public–private partnership included innovative water consumption concepts applying higher standards than required by the municipality (A3_1, A3_2). Consequently, both regulation and self-regulation are included in Fig. 4 as strong external elements. With respect to structural elements, the tendering offer, the contract, and the committee relate to the achievement of ecological sustainability. Although the opportunity to include diverse sustainability-related aspects in the functional tendering offer is restricted, the link between ecology and economy from a private partner’s perspective results in ecological sustainability-related outcomes in the case under investigation. Moreover, the case revealed the following aspects to be included in the contract: Building on the (negative) experiences made by other municipalities, the public partner tried to fix as many aspects in the contract as possible, including noise levels, water temperature and water quality. The 25-year life cycle contract enabled the private partner to invest in ecological aspects due to the long amortization phase (A1). Furthermore, the charter for laying the foundation stone in November 2011 highlighted the pool’s sustainable use of energy and natural resources. Lastly, as presented above, the committee contributes to ecological sustainability as well. With respect to the role of process elements, shared understanding and communication are of relevance. Moreover, the public partners (in particular the municipal council members) have taken on a perceived leadership role regarding ecological sustainability (A1; A2_1; A2_2; A3_2; C2; C3). The municipal council members from the Green party point out their genuine interest in such issues (C2); nevertheless, the private partner took over a leading role in this regard as well: In the public bathing and swimming pool industry, the question of expertise is closely related to ecological aspects, but also to technical and economic issues (P1). Thus, the private partner could offer further aspects and facilities in addition to the contract (A1). The public partner believes that ecological aspects, such as an innovative energy concept, are strongly linked to economic benefit in this particular project. This resulted from the fact that the winning model, for example, acknowledged the beauty of the surrounding landscape, and the complex is now embedded into the landscape using green roofing (A1). Furthermore, the private partner acknowledged that it fulfilled a leading role when it was needed from the municipality (A3_1). The private partner explains its leadership with the fact that “good economy is automatically good ecology” (P1; A3_1), thereby achieving sustainability outcomes and avoiding any “window-dressing regarding ecology” (P1). As depicted in Fig. 4, the interplay between external conditions and internal elements is rather complex in the case of ecological sustainability. The empirical findings show that extensive regulation in the bathing and swimming pool sector has decreased the need to include ecological aspects in the contract (marked with “−“), as seen in the fact that the municipality does not set standards beyond existing regulation regarding ecological aspects (A1, A3_1). At the same time, this industry is marked by a strong industry self-regulation as reflected in the leading role by the private partner regarding ecological issues (A2_2; A3_1; A3_2). Strong self-regulation has decreased the need to include sustainability-related aspects in the tendering offer and contract (both interrelations marked with “−“). Thereby, the findings also reveal that industry self-regulation is based on a strong link between ecological and economic aspects (P1; A3_1). Regarding the interplay of internal elements, our data that were collected at the pre-contract phase reveals that both tendering offer and contract were strongly linked to communication as a process element (depicted by the neutral arrows between these internal elements). Water quality and water temperature were discussed by the partners and finally became part of the contract (A1, A2_1). This discussion was possible due to the functional tendering offer that gave leeway and did not concretize all possible ecological aspects in advance (A3_1). Regarding external conditions for social sustainability, the case under investigation revealed citizen initiatives as relevant. Since the new swimming pool complex was not able to equally meet the demands of all user groups (including “pure swimmers”, A3_1), several citizens founded an initiative in June 2009, which made the effort of calling a referendum (C3). Another reason put forward by this opposition was the planned closing of two school swimming pools (A1, C2). With respect to structural elements, the contract and the committee play a specific role. Regarding the contract, social sustainability-related criteria were included in the contract negotiating phase. For example, the issue of contracting local enterprises as subcontractors as a soft factor in the call for tenders was raised again in the negotiation phase and finally became part (“wherever possible”) of the public–private partnership contract (A2_1; A3). The final contract includes aspects about the treatment of the existing staff and the inclusion of local enterprises as suppliers (A2_1; A3_2). Regarding process elements, our data reveals the public partner’s trust in the private partner’s interest regarding sustainability: from the public partner’s perspective, trust derives not only from the fact that the private partner comes up with positive economic results, but also that it is socially responsible. Besides trust, shared understanding and communication contribute to social sustainability. In addition, public partner leadership contributes to social sustainability: The public partners (in particular the council members) perceive themselves to have also taken on a leadership role regarding social sustainability (A1; A2_1; A2_2; A3_2; C2; C3). With respect to customers, public partners assured socially acceptable and affordable admission fees (A2_1; C2; C3). The municipality convinced the private partner to employ the municipality’s personnel during winter times when the open air swimming pool is closed (A2_2). Supporting local enterprises, especially small and medium-sized ones, was a declared objective of the public partner (A1; A2_1). At the same time, the private partner can play a leading role in cases where there is a strong link between the social and economic sustainability: The private partner provides a shuttle bus at its own expense to the remaining public open-air swimming pool and from the schools to the new complex (A2_1; C1; C3). The private partner agreed to subsidize the public open-air swimming pool as this municipality’s social “melting pot” through an annual amount from the profits generated in the new swimming pool complex (A1; A3_1). As shown in Fig. 5, citizen initiatives as an external condition were very important for the interplay with internal elements. The voice of citizens increased the need to strengthen sustainability-related communication (marked with “+” in Fig. 5). The increased socially oriented communication contributed to the recognition of social sustainability issues in the contract: Although both partners acknowledged the voluntary sustainability orientation by the other, as revealed in the sections on trust and shared understanding as well as leadership, the importance of sustainability-related elements, such as the cooperation with local SMEs, needed to be fixed in the contract (A1–, A2_1; C1; A2_2; P2; A3_1; P3). Overall, the in-depth analysis of our case allows us to describe how external conditions and internal elements contribute to sustainability-related outcomes in public–private partnerships. By analyzing sustainability in a fine-grained manner, we first find that different external conditions are relevant for the achievement of different sustainability dimensions as an outcome of the public–private partnership. Second, we explain how internal elements, that have been discussed as potentially relevant to sustainability-related outcomes of the public–private partnership, are central to specific sustainability dimensions. Third, we show how external conditions can both decrease and increase the relevance of sustainability-specific internal elements of the public–private partnership, and how different internal elements are linked to each other when targeting sustainability-related outcomes. Regarding the first aspect (role of external elements for sustainability), prior research has shown that regulation is an important means to increase economic sustainability, for instance in terms of intergenerational justice, but it sometimes falls short of actually reaching the objectives (Magin 2010). Based on our case data, regulation was included as the only external condition of relevance for economic sustainability. The importance of regulation that targets a partnership’s efficiency is in line with previous literature on public–private partnerships, which traditionally focused on efficiency gains in partnerships as compared to purely public provision (Forrer et al. 2010; Koppenjan and Enserink 2009; Ysa 2007). The central aspect of regulation for economic sustainability in our case is the supervisory authority’s role in reviewing the contract. This refers to a traditional regulatory role of the state (e.g. Cuthill and Fien 2005) in addition to legislation and directives that have particularly been highlighted as a public sector’s governing initiatives towards social and ecological sustainability (e.g. Albareda et al. 2007). For ecological sustainability, previous research has shown that regulation is an important determinant (Christmann 2004; Eberlein and Matten 2009), as is industry self-regulation (Bowen et al. 2018; Hoffman and Georg 2013), depending on the respective industry. Based on our case, we found that both regulation and self-regulation were included as strong influences on internal elements of the public–private partnership. This allows us to draw the conclusion that both instruments are complements rather than substitutes (King et al. 2012; Short and Tollel 2010), which actually contribute to positive sustainability-related outcomes at least in the sector under investigation. For social sustainability, our results complement existing research on the enhancement of sustainability by detecting citizen initiatives as crucial external condition that contributes to increased social sustainability as outcome of the public–private partnership. For public–private partnerships with a general interest of the citizens, citizen involvement is rather likely. This finding supports a public management perspective that places citizens in the forefront in the context of public service provision and ongoingly discusses the role of citizen participation (e.g. Bryson et al. 2013; Fung 2015). It also enhances existing literature on the relevance of involving citizens in public–private partnerships (Boyer et al. 2016; Chen et al. 2013). From a managerial viewpoint, the findings on the relevance of external conditions reveal the need to thoroughly examine the public sector’s regulatory framework regarding economic sustainability. With regards to ecological sustainability, we suggest that any public–private partnership analyze the regulatory environment and the degree of industry self-regulation before focusing on internal aspects. The finding on citizen initiatives shows the need to involve citizens in public–private partnership to enhance social sustainability. As we find support for the relevance of both regulation and industry-self regulation, as discussed in the literature on sustainability for sustainability-related outcomes in public–private partnerships, we see as policy implication that regulation regarding the three dimensions of sustainability (or the 17 sustainable development goals) is a relevant external driver for sustainability outcomes. Regarding the second aspect (role of internal elements for sustainability), three structural and four process elements have been revealed as relevant for economic sustainability. We interpret this finding against the background of the traditional focus on efficiency, which might have resulted in rather elaborate structural and process elements of public–private partnerships. Regarding the latter, the assumptions for collaborative dynamics made by Emerson et al. (2012) are confirmed by our case study, which revealed the relevance of trust, shared understanding, communication, and leadership and their contribution to the concrete outcome of economic sustainability. Contrary to the rather striking differences between the sustainability dimensions regarding influential external conditions, the differences regarding the internal elements are rather small: For ecological sustainability, trust was not included as a process element. Regarding social sustainability, the tendering offer as structural element did not play a role. We discuss these findings below by taking the revealed interplay of elements into account. Regarding structural elements, our results concretize existing findings on governance (Walker and Hills 2012) by specifying the role of specific instruments, such as a committee on specific sustainability outcomes. This contributes both to flexibility due to innovation over the life-cycle and to necessary adjustments. As our results reveal the relevance of all dimensions within the contract, the latter needs to allow innovation in all three dimensions of sustainability over the whole life-cycle (Hansen et al. 2009) of the partnership. Regarding the process elements, our case study shows that to achieve sustainability in a public–private partnership, both partners must indeed “continuously seek improved ways of increasing the sustainability of policies and activities” (Bovaird 2004, p. 211), in particular, by establishing a shared understanding and by communicating. In addition, we find evidence for both leadership by the public partner (in line with Klijn and Koppenjan 2000) and private partner leadership as an expression of their corporate social and ecological responsibility (Crane and Matten 2007). Regarding the third aspect (role of the interplay between the different elements for sustainability), we interpret the non-relevance of trust to achieve ecological sustainability as related to the high level of both regulation and self-regulation as external conditions. Here, the ecological outcomes are very transparent, for example, that water consumption and water quality are easily measurable, as is energy consumption. Since the industry association regulates itself based on these measures in a transparent way, tendering offer and contract did not have to fix these aspects but instead, public partners could rely on the experts’ self-regulation. Thereby, the industry self-regulation diminishes the importance of trust as the public partner may put confidence in the behavioral outcomes. Our finding that both regulation and industry self-regulation decrease the need to include sustainability-related aspects in internal elements can be interpreted against the background of research on ecological innovations. As described by Williamson and Lynch-Wood (2012), companies with a high level of capacity and visibility for ecological innovations are likely to engage in industry self-regulation and also comply with regulation. The study by Galliano and Nadel (2015) found that regulatory compliance is likely to be complemented with mimetic effects of complying with industry standards of good (environmental) practice, since both increase the propensity of ecological innovations. We derive as an implication that regulation and industry self-regulation may both contribute to competitive advantage of private companies with a high level of ecological innovation, thereby contributing to ecological outcomes of a public–private partnership. Regarding the non-relevance of the tendering offer to achieve social sustainability, our results show that, despite new findings on the potential to include sustainability-related objectives in the tendering offer (Hueskes et al. 2017), social sustainability has not been in the forefront of the tendering offer under investigation. However, the citizen initiative as an external condition contributed (amongst other aspects) to an accepted level of social sustainability in the final contract via respective communication efforts. Nevertheless, it seems that the current tendering system in public procurement does not reflect citizens’ perspectives in a sufficient way. For managing public–private partnerships, we derive the implication that including citizens in the designing phase may pose a challenge, since their demands may differ across municipalities and may also be subject to change over time. Therefore, the internal element of communication becomes a crucial aspect to transform citizens’ legitimate demands into the contract. Criteria for social sustainability may not be standardized, but policy makers could ask municipalities considering public–private partnerships to submit a concept for citizen participation. As suggested by a recent UK study, social value criteria can be included in the tendering process to meet citizen’s expectation to a higher degree (Local Government Association 2017). The presented findings have to be reflected against the exploratory nature of the research design. The identification of the case allowed us to analyze it in a longitudinal way, since we could conduct interviews at two points in time. However, we could not cover more points in time, which we want to acknowledge as a limitation. Our critical case adds to existing theory about how to achieve sustainability-related outcomes in public–private partnerships by detailing relevant external and internal elements, as well as their interplay with respect to the three sustainability dimensions as outcomes of public–private partnerships. Though we cannot explicitly proof causal relationships between the elements and their interplay on the one hand and sustainability outcomes on the other hand, this study clearly reveals in how far sustainability is considered within the different elements and in the interplay between elements. Moreover, the question of generalizability needs to be addressed. The critical case that serves as basis for theory development sought inferential rather than representational generalization (Lewis et al. 2014). In particular, the external conditions that are characteristics of the chosen industry may restrict the findings to comparable industries, i.e. strong regulation and industry self-regulation regarding ecological sustainability, and a service that is of interest to citizens which leads to their involvement in citizen initiatives. Moreover, the particularity of the nature of the service comes along with the fact that ecological aspects are fundamentally linked to economic success. However, the external conditions as contingent factors have been shown not to interfere with the internal elements regarding economic sustainability. In the case of ecological sustainability, the external factors particularly impact on structural elements and not on the relevant process elements of shared understanding, communication, and leadership. Regarding social sustainability, only communication is linked to the external contingent factor, whereas trust, shared understanding, and leadership are not linked to this factor. As a consequence, the majority of process elements seem to be relevant for the achievement of sustainability in public–private partnerships, independent of the chosen industry. With respect to the structural elements, the central role of a committee for the achievement of sustainability-related outcomes in public–private partnerships might be inferred to other partnerships, independent of contingent factors as well. Based on our framework of combining regulation and industry self-regulation as external conditions with internal structure and process elements, we analyzed a critical case of a public–private partnership in the public bathing and swimming pool sector. We contribute to the growing research field on sustainability and public–private partnerships in the following way. Our main insights regarding external conditions of public–private partnerships are that for economic sustainability, regulation is important, whereas for ecological sustainability, regulation and industry self-regulation seem to complement each other. For social sustainability, citizen initiatives come into play as relevant external conditions. The findings regarding internal elements vary slightly for the three sustainability dimensions, but those which are important for all three are: contract and committee as structural variables; and shared understanding, communication and leadership as process variables. As our case study shows, long-term oriented public–private partnerships offer the unique opportunity to combine the provision of public and private goods in a sustainable way. Public–private partnerships are not simply different forms of public procurement for the sake of efficiency, but rather vehicles to integrate private companies’ know-how, financial means, and sustainable interest into the provision of public services. Since public–private partnerships typically provide public or quasi-public goods and services for the benefit of a third party, sustainability is likely to complement the above-mentioned core investigated outcome variables in such partnerships. Our finding relates to the observation made by Albareda et al. (2008) that the public sector needs to establish a relationship with the private sector that both contributes to sustainability and fits the private partners’ business agenda. These findings on regulation and industry self-regulation may help find policy implications regarding what constitutes a “smart mix of voluntary policy measures and, where necessary, complementary regulation” (European Commission 2011, p. 4). In terms of future research, we see that the interplay between sustainability and public–private partnerships is evolving as a research field, which offers the opportunity to analyze many more aspects. For instance, future research could measure sustainability-related outcomes over time and triangulate these with standardized, repeated surveys among the citizens of the public partner’s municipality regarding their perception of the sustainability of the public–private partnership. The link between sustainability-related outcomes and different political backgrounds of the public partner could also be analyzed to reveal the potential influences on the common goal and mutual understanding of sustainability. In this attempt, stakeholder pressure from community groups, nonprofit organizations, and civil society, could be included, since public–private partnerships are likely to shift power away from those entities and towards private companies (Bovaird 2004; Torchia et al. 2015). The analysis of which elements of public–private partnerships explicitly help contribute to the SDGs may also spur future research. Due to the fact that the SDGs were formulated years after we started collecting data for this case study, we could not use them as a framework or in the interviews themselves. However, future research could work on this research area more specifically. The authors thank all the interview partners for their fruitful collaboration. They thank the anonymous reviewers for their valuable comments and suggestions and are grateful for comments received at the annual conferences of VHB, IRSPM, and Academy of Management. The conference participation was supported by the German Academic Exchange Service and the Julius-Paul-Stiegler-Gedächtnis-Stiftung at the University of Mannheim. The authors thank their colleagues, in particular Bernd Helmig, Alexander Pinz and Franziska Wallmeier, for helpful suggestions. European Commission. 2010. Europe 2020: Strategy for Smart, Sustainable and Inclusive Growth: COM/2010/2020. Retrieved from http://ec.europa.eu/eu2020/pdf/COMPLET%20EN%20BARROSO%20%20%20007%20-%20Europe%202020%20-%20EN%20version.pdf. European Commission. 2011. A Renewed EU Strategy 2011–2014 for Corporate Social Responsibility: COM/2011/0681. Retrieved from http://www.europarl.europa.eu/meetdocs/2009_2014/documents/com/com_com(2011)0681_/com_com(2011)0681_en.pdf. Partnerschaft Deutschland. 2017. Project database. Retrieved from https://www.ppp-projektdatenbank.de. Local Government Association. 2017. Encouraging innovation in local government procurement: National Advisory Group report. https://www.local.gov.uk/sites/default/files/documents/4.35%20Encouraging%20Innovation%20in%20LG%20Procurement_v04_0.pdf. Partnerschaft Deutschland (PD - Berater der öffentlichen Hand GmbH). 2011. ÖPP und Sportstätten. Retrieved from https://www.pd-g.de/fileadmin/Daten/Redaktionelle_Bilder/110908_OePP-Schriftenreihe_Bd-4_Sportst%C3%A4tten.pdf.